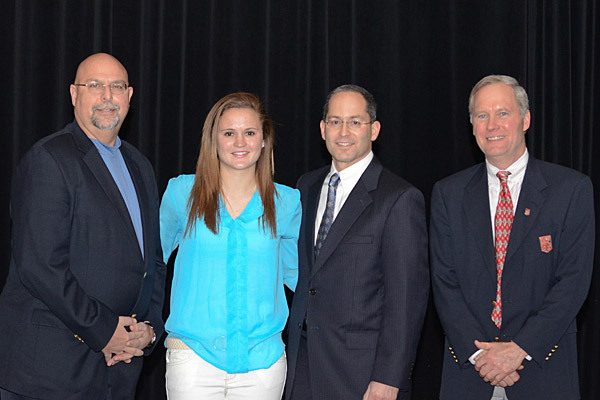 UD freshman Grace Firestone was honored during a recent event at Tower Hill School, her alma mater. With Firestone are (from left) Tommie Neubauer of the Delaware Interscholastic Athletic Association, State Sen. Michael S. Katz, who presented a tribute from the Delaware Senate, and John Gillis of the National Federation of High School Associations, who presented a Spirit of Sport Award. 10:08 a.m., April 16, 2012--University of Delaware freshman Grace Firestone grew up in a Wilmington, Del., neighborhood full of boys, and thus sports were always the activity of choice during her childhood. Her athleticism took off from there, and she earned 15 varsity letters during her high school years at the Tower Hill School. The compassion, intelligence and strength she demonstrated both on and off the field earned her a prestigious national award. Firestone, a biological sciences major and Honors Program student at UD, is one of only eight students nationwide honored this year with the National High School Spirit of Sport Award granted by the National Federation of State High School Associations. In addition to being the president of the Tower Hill student body, an All-State athlete in soccer, basketball and volleyball, and an exceptional student, Firestone developed a community service project Let the Kid’s Play. The project raised close to $5,000 through fundraisers she organized among her athletic teams, and Firestone was able use the proceeds to help sponsor the athletic dreams of disadvantaged youth across the globe. Just three days after her high school graduation, her strength and determination to help others would be forced to turn inward; she had to fight for her life. Late in the evening on June 6, 2011, Firestone’s heart stopped. She had to be shocked six times to prevent heart failure. She would spend 10 days in the hospital and leave with a defibrillator implanted in her chest. Firestone said she does not remember much of the day her heart stopped, but she knows friends and family were by her side through that difficult time in her life. She said she has gained even more motivation from them after witnessing the support they gave her throughout the summer. “That’s what I want to be for other people,” Firestone said. The physical challenges she faced as a result of her heart failure could not keep her from returning to the soccer field. She currently plays for the University’s club team, and while she made sure she gave herself some time to adjust to physical exertion, she quickly rekindled her passion for the sport and now plays full games. Firestone said her aspirations for medical school were solidified by her rare heart failure, which doctors said was likely the result of a virus. She said she also gained greater resolve to continue to develop Let the Kids Play and use her story as an opportunity to inspire others to join her cause. “If I am someday able to give others hope for a new life through medicine, I think that that would be one of the best ways to say 'thank you' for my own,” Firestone said. The Spirit of Sport award was presented to Firestone at a ceremony on April 2 at Tower Hill. State Sen. Michael Katz attended the event and presented Firestone with a state of Delaware Senate Tribute, commending her receipt of the award. University alumna Amanda Blackstone was Firestone’s head coach for basketball and an assistant coach for Firestone’s soccer and volleyball teams at Tower Hill. Blackstone also teaches physical education at the Tower Hill lower school, and said even the younger students all knew Firestone and were always excited to hear about her athletic success. She said Firestone inspired her personally, as well. “You wanted to be part of what she was doing and what her movement was,” Blackstone said. Blackstone said that as a young coach, she was astounded to be able to work with such a strong athlete. She said Firestone set an incredible example for other student athletes, and she has been inspired to encourage other students to shoot for the same excellence. “I am going to definitely keep pushing kids to reach that bar,” Blackstone said.